Aging, sun damage, hormones and chemical imbalance can all cause visible imperfections on our skin such as brown spots, redness and spider veins. While it’s common to experience these issues, it’s also very easy to treat them. 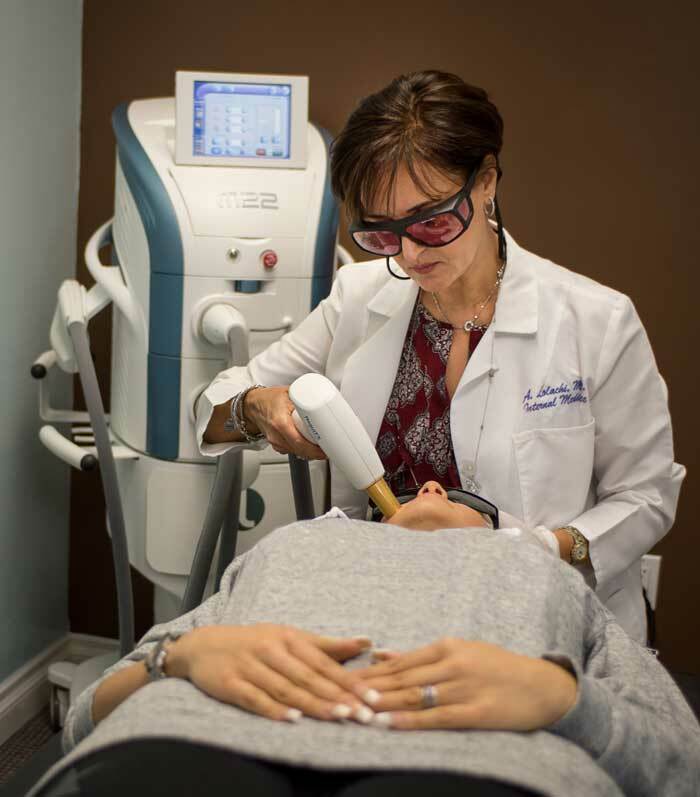 With an Intense Pulsed Light (IPL) photofacial you can regain a smooth and youthful complexion within 2 to 4 weeks. IPL therapy works by using a device which delivers light energy to target either hemoglobin (the red blood cells in the blood vessels) or melanin (the brown pigment in freckles and age spots). It causes the hemoglobin or melanin to break down, so that it can be absorbed by the body making the spots less visible. IPL works gradually over a series of 3 to 5 sessions, each spread one month apart. Since the skin must not have a suntan it’s best to take the treatments during the winter and Spring months. The treatment will be administered in our tranquil spa setting by Dr Lolachi, who has carried out thousands of successful IPL procedures at the practice. It’s highly important to have a professionally trained doctor carry out the treatment, since without expert supervision IPLs can cause serious burns or pigmentation issues. There may be some mild discomfort during the treatment, but most patients find it very tolerable. The sensation can be similar to having a rubber band gently snapped against the skin and it gradually becomes more comfortable as your skin begins to clear with the treatments. Each session usually takes 20-30 minutes, depending on the size of the area. The effects of IPL are gradual so you’ll notice the improvements with every session. Immediately after the the treatment your skin may look slightly redder and the spots might be slightly darker, so it’s recommended to apply sunscreen to keep skin protected. Within about 7 days your skin will start to clear and you’ll notice the miraculous improvements.